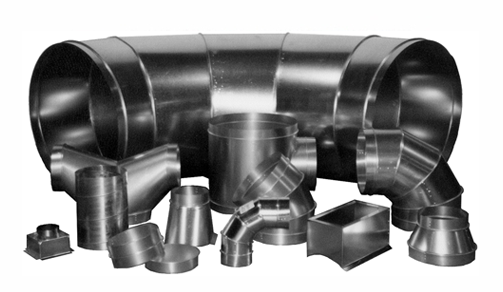 If you are looking for cost-competitive round duct and fittings shipped to your schedule, Midwest Metal Fabricators, LLC is your supplier of choice. We offer a large selection of round ductwork fabricated to SMACNA 2005 Rev 3 standards using minimum G60 lock forming quality galvanized steel, type 304 or 316 stainless steel, alloy 3003 H14 aluminum, galvannealed paint grip steel, and poly-vinyl coated steel. We also offer fabricating services per your request for other materials. The chart below indicates our stocked materials, however, we do handle other materials for fast turnaround times. Call or fax us with your requirements. Midwest Metal Fabricators, LLC should be your supplier of choice for Double Wall Round Duct and Fittings.. We offer a large selection fabricated to SMACNA 2005 Rev 3 standards. We stock the following: minimum G60 lock forming quality galvanized steel; type 304 stainless steel; alloy 3003 H14 aluminum; galvannealed (paint grip) steel; and poly-vinyl coated steel for outer wall construction. Inner wall construction can be solid material or for galvanized we offer standard perforated steel construction We also offer fabricating services per your request. The chart below indicates our stocked materials; however, we do handle other materials for fast turnaround times. Call or fax us with your requirements. Midwest Metal Fabricators, LLC should be your first source for oval pipe and fittings. We offer a large selection of oval ductwork fabricated to SMACNA 2005 Rev 3 standards. We stock the following: minimum G60 lock forming quality galvanized steel; type 304 stainless steel; alloy 3003 H14 aluminum; galvannealed (paint grip) steel; and poly-vinyl coated steel. Pipe is offered standard as spiral oval with lock-formed seams. We also offer fabricating services per your request. The chart below indicates our stocked materials; however, we do handle other materials for fast turnaround times. Call or fax us with your requirements. Midwest Metal Fabricators, LLC should be your first source for double wall oval pipe and fittings. We offer a large selection of double wall oval ductwork fabricated to SMACNA 2005 Rev 3 standards. We stock the following: minimum G60 lock forming quality galvanized steel; type 304 stainless steel; alloy 3003 H14 aluminum; galvannealed (paint grip) steel; and poly-vinyl coated steel. 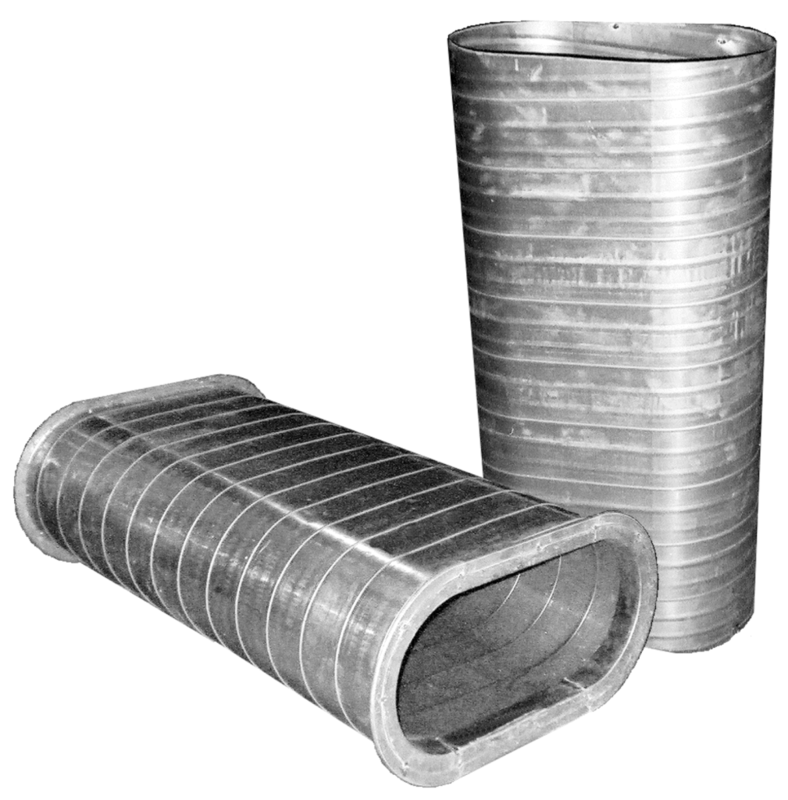 Pipe is offered standard as spiral oval with lock-formed seams. We also offer fabricating services per your request. The chart below indicates our stocked materials; however, we do handle other materials for fast turnaround times. Call or fax us with your requirements. Midwest Metal Fabricators’ rectangular duct and fittings are factory fabricated to furnish you with a high-quality line of products in a broad range of standard sizes. To minimize field-assembly costs, rectangular duct is supplied in lengths up to 5 feet. Longitudinal seams are typically made with Pittsburgh locks or button-punch snap locks (see below). In addition to economical TDF™ transverse duct connectors, slip & drive slip joints, four-bolt connectors, and applied second source duct connectors are available. Single wall rectangular ductwork can be shipped completely assembled or knocked down. Midwest Metal Fabricators’ standard rectangular products are fabricated to meet SMACNA’s 2005 Rev. 3 duct construction standards using 26 to 16 gauge hot-dipped galvanized steel. Plus, we can custom fabricate rectangular ductwork for commercial and industrial applications according to your specifications in 3003-H14 aluminum, paint-grip steel, 304 stainless, and PCD coated steel. Midwest Metal Fabricators’ stocks a wide variety of materials and thicknesses to insure timely shipments of orders.